In the past few years every major fantasy MMOG that has launched has been compared to WoW in some way or another, with some even being crowned the WoW killer. 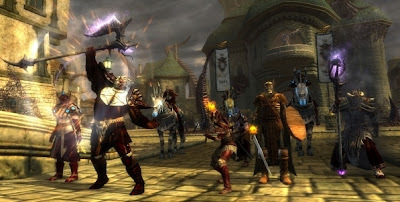 None have gone as far as Rift though, launching TV ads that boldly proclaim: “We’re not in Azeroth anymore.” With over a million players pre-ordering and the headstart servers packed to capacity, Rift may be the first serious challenger to take a bite out of the WoW playerbase. Can Rift survive past the first 30 days and maintain steady growth, or will it lose a war of attrition as players flock back to their old games? It’s probably too early to tell but the answer may lie in some of the things we have seen in the first five days. Thus far, Rift has been one of smoothest running and best performing games at launch in recent memory. Servers have been incredibly stable, client-side lag has been negligible and even the most populated of areas have run smoothly. Individual computer performance can play a huge role in this of course, but even playing on my older laptop the game was incredibly smooth, albeit with graphics setting adjusted down slightly. 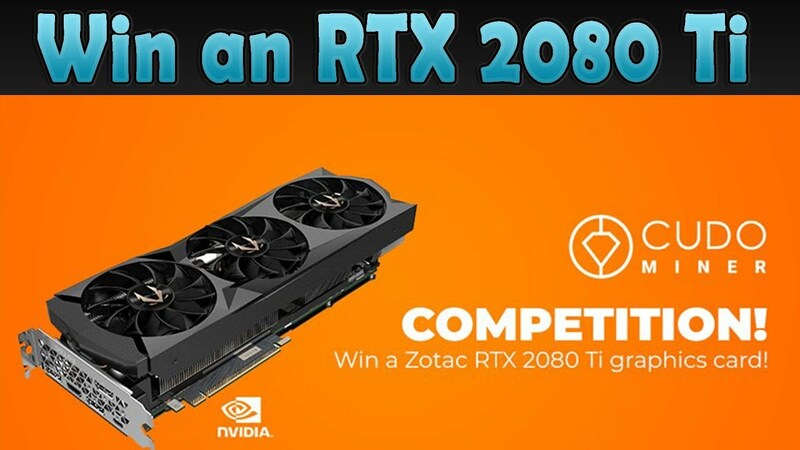 The only major knock on game performance has come from those unable to get into the game due to some fairly lengthy server queues. 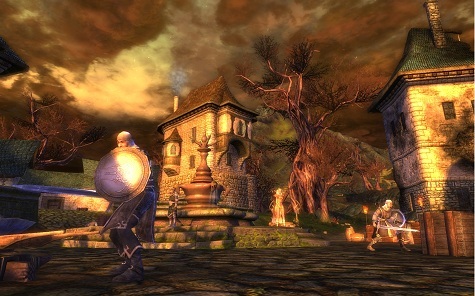 Trion has been swift and measured in regards to this and has introduced several new servers to help ease the load. There have been a few instances of server restarts and minor performance-related patches, which can normally be frustrating. 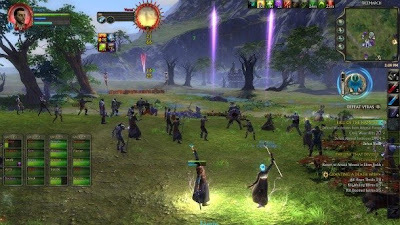 Unlike most games at launch, however, the folks at Trion Worlds have been spot on in their estimation of downtime and have usually had the servers back up within 15 minutes. 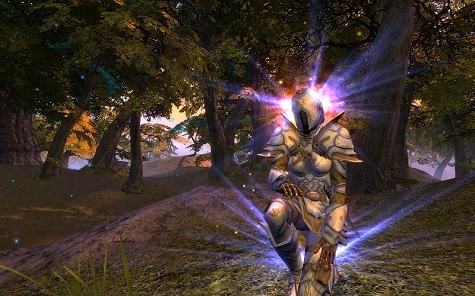 In Rift you play the role of an Ascended, a hero brought back to life to battle the forces of Regulos, who seeks to destroy Telara, as well as to battle the otherworldly forces his attacks have unleashed by creating tears in the fabric of reality. The world is divided into two major factions, the Guardians and the Defiants. The former is comprised of the races that trust in the gods of the Vigil and the latter is made up of those who have shunned their teachings and instead put their faith in technology. Since all classes and callings are available to both factions, the choice is a purely aesthetic and lore-related one. A brief cinematic brings new players up to speed with a history lesson tailored to the faction of their choosing that helps usher them into the game world. The process of choosing your first soul will introduce you to the games quest mechanics and begin a linear chain that moves you quickly through the first zone and first 15 levels of the game. All of the major components of Rift are introduced fairly early, with the obvious exception of end-game raiding. The leveling process is a quick one, perfect for today’s brand of MMOG player, but like any other form of repetitive gameplay it can get monotonous fairly quickly. Planar invasions are there to help break up that grind, build up the community, and offer an extra dimension of gameplay. Invasions can happen anywhere and at any time, even in cities and quest hubs – reinforcing the feeling that nowhere is safe in Telara. Participating in these events is as simple as showing up; with the auto-grouping feature there is no need to beg for an invite or worry about getting proper credit. Each invasion has waves and each wave has various objectives that are spelled out in a UI frame that opens up when you are in range of the event. Completing the objectives rewards you with coin as well as a planar currency and can often times gives you a chance at rarer rewards. Combat is fast paced and fun, with spells and abilities being unlocked by spending talent points in the various soul trees. 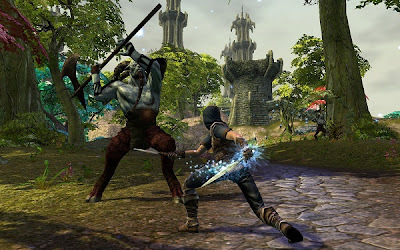 Being in direct control over which combat abilities you have at your disposal can make you feel much more invested in your character and encourages you to spend some effort in creating a well-rounded build. In an era of cookie cutter specs, armor that looks the same and so many classes brining the exact same things to the table, it is refreshing to be able to craft something unique with your character. Existing somewhere between ultra-realistic and a slightly caricatured art direction, Rift does a good job at finding a happy medium and allowing you to control the level of detail best for your machine. Telara is a beautiful but frightening place, and the game’s graphic engine does a good job at conveying that without forcing you into upgrading your system or bottlenecking performance. I am still of the opinion that putting too much stock in the graphics of an MMOG is the surest way to miss out on a great experience. Leave texture scrutiny and polygonal pixel count debates to the single player games - as long as the graphics don’t detract from the feel of the game world. That being said, the one minor detraction for me so far has been the character models. While I do like the look of a couple of the races, they are lackluster overall. However, if having bland looking characters facilitates smooth gameplay with hundreds of us on the screen at the same time, then it’s a tradeoff I am willing to accept. The base UI is well appointed and laid out well, with every element having the ability to be moved and adjusted. While I would like to see UI modifications come down the pipe at some point ( especially ones that would modify the mini-map), Rift has one of the better out of the box interfaces available. The music, ambient sounds and voice acting are all top notch and indicative of a AAA title with high production value. At this early stage of the game, and even throughout pre-launch testing I have yet to encounter a glitch or a bug with any audio component of the game. Perhaps I lack an audiophile’s finely honed ear, but everything I have heard so far has been a nice compliment to my immersion factor. Free-to-play purists might balk at the $14.99 monthly subscription, but no one can argue that well supported games with high quality communities can easily command a monthly fee. Rift shows every sign of satisfying both criteria, especially in light of how responsive Trion has been to player feedback throughout beta. Yet, with the game less than a week old and no clear idea of Trion’s post-launch plans for the game, it is hard to accurately assess the value factor. Having box sales of over 1 million by the headstart date would seem to indicate that the price point was set correctly, and I personally thought the collector’s edition was very well priced. 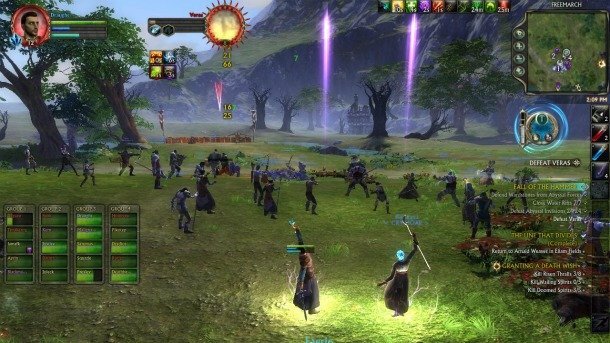 Trion also offered special subscription rates for early adopters, but the value there will be highly predicated on the game gaining some long term traction. Working hand in hand with value, lasting appeal will be largely dependent on the game’s community. All the major components are in place: a strong storyline, faction-based conflict, a robust endgame, and multiple paths for character advancement – now it just rests in the hands of the players to determine how well all these elements work for them. I am fascinated by the soul system and can’t wait to see how the various and unique builds will work together, and as long as that aspect of the game doesn’t get dumbed down or forced into homogenized blandness then I can’t see any reason not to play Rift for a long time. While it is impossible to tell the future of any MMOG, no game since WoW has done so much so right so quickly. With all of its ducks in row, Rift has the potential to succeed where many other games have failed in their ability to retain players past the initial 30 days. A smooth headstart launch, marred only by the tears of those stuck on the outside looking in, gives a strong indication of big things to come. For the good of AAA MMORPGs everywhere, let’s hope that Rift continues to live up to its expectations and doesn’t buckle under the weight of its own lofty goals.